Tripura is a state nested cozily in the north east of India. Tripura may not make the headlines very frequently in the national newspapers, but its natives need to keep in touch with their state and what happens there. Many of our readers who stay and work out of their beloved homelamd, follow the Tripura news religiously. We present the latest Tripura news for those of you who avidly follow emerging news from Tripura updated to the minute. We hope it serves your purpose. Do send us a feedback on the quality of Tripura related news served to you, so that we can make it better for you. You can also save this page as your default page so that you do not have to go looking for it everytime you want to check on the latest Tripura news updates. 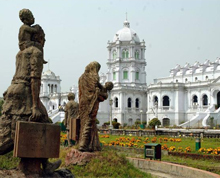 Agartala, April 19 (IANS) After polls to the Tripura East Lok Sabha constituency were rescheduled, the deployment of 12 companies of the Tripura State Rifles (TSR) in West Bengal has been postponed, officials said here on Friday. View More..
Agartala, April 18 (IANS) The Election Commission (EC) will file FIRs against presiding officers and political activists who indulged in malpractices during the first phase of polling in Tripura West Lok Sabha constituency on April 11, according to officials on Thursday. View More..
Agartala, April 17 (IANS) Most political parties and candidates in Tripura East Lok Sabha constituency resumed their campaign on Wednesday after the Election Commission (EC) deferred Thursday's polling to April 23 citing an "unconducive situation". View More..
Agartala, April 16 (IANS) Polling to Tripura East parliamentary constituency, slated for the second phase of Lok Sabha elections on April 18, has been deferred, a top official said late Tuesday night. View More..
Agartala, April 16 (IANS) Polling to Tripura East parliamentary constituency, slated for the second phase of Lok Sabha elections on April 18, has been deferred, it was announced late on Tuesday. View More..
Agartala, April 16 (IANS) Tripura, which has traditionally witnessed a direct or triangular contest, will for the first time in seven decades see a multi-cornered battle as the ruling BJP has emerged as a potent political force after last year's Assembly polls. View More..
Agartala, April 15 (IANS) A young tribal boy killed three people including a woman and injured another in northern Tripura after a brief altercation late on Sunday night, police said on Monday. View More..
Agartala, April 15 (IANS) Before campaigning for the second phase of the Lok Sabha elections ends on Tuesday, some candidates from Tripura East constituency used the 'Poila Baisakh' (Bengali New Year) on Monday to reach out to the electorate personally. View More..
Agartala, April (IANS) Reiterating its demand to hold repoll in 464 of the 1,679 polling stations in the Tripura West Lok Sabha constituency, the CPI-M led Left Front opposition on Sunday demanded free and fair polling in the Tripura East seat which goes to the polls in the second phase on April 18. View More..
Agartala, April 14 (IANS) An eclectic range of individuals, ranging from an ex-royal who is a remote sensing specialist, a teacher, a law student, a former bureaucrat, one who is unlettered and even a novice in politics are trying their electoral luck in the Lok Sabha polls in Tripura. View More..
Agartala, April 13 (IANS) Doctors and other staff members of Tripura government hospitals, on strike since beating up of a surgeon on Thursday, called off the protest on Saturday following intervention of the high court and the state government. View More..
Agartala, April 12 (IANS) Doctors and staff at government hospitals in Tripura on Friday threatened to resign en-masse demanding action against people who thrashed a surgeon at the Indira Gandhi Memorial (IGM) Hospital here. View More..
Agartala, April 11 (IANS) Over 81 per cent of the total of 13,47,381 electorates voted on Thursday for the first phase of balloting in Tripura West parliamentary seat, officials said. View More..
Agartala, April 11 (IANS) The Congress and the CPI-M have alleged poll malpractices by the Bharatiya Janata Party (BJP) government at the Centre and in Tripura during the voting for the Tripura West Lok Sabha seat on Thursday. But the BJP rejected the charges saying "opposition parties are making false allegations to cover up their defeats". View More..
Agartala, April 11 (IANS) Over 78 per cent of the total of 13,47,381 electorates voted on Thursday for the first phase of balloting in West Tripura parliamentary seat in Tripura, officials said. View More..
Agartala, April 11 (IANS) Around 60 per cent voting was recorded in the first seven hours of polling (up to 2 p.m.) on Thursday for the West Tripura parliamentary constituency in Tripura, election and police officials said. View More..
Agartala, April 11 (IANS) Around 25 per cent voting was recorded in the first three hours of polling on Thursday for the West Tripura parliamentary constituency in Tripura, election and police officials said. View More..
Agartala, April 11 (IANS) The voting for Tripura West parliamentary constituency bagan amidst heavy security on Thursday, officials said. View More..
Agartala, April 11 (IANS) With the Tripura West Lok Sabha constituency going to the polls in the first phase on Thursday, the opposition parties are fearing intimidation and violence by the ruling Bharatiya Janata Party (BJP), while the BJP has snubbed the claims of hostility by it. View More..
Agartala, April 10 (IANS) The northeastern states are likely to see a tripartite battle in these elections, with the local parties gaining strength in the erstwhile Congress bastion on local issues and sentiments, even as the BJP makes inroads there, say political experts. View More..